Follow this tutorial and you'll learn how to use vector tools in Paint Tool SAI and include them in your usual working process. We will start with a simple sketch and go through the whole method of creating the set of four different gems. 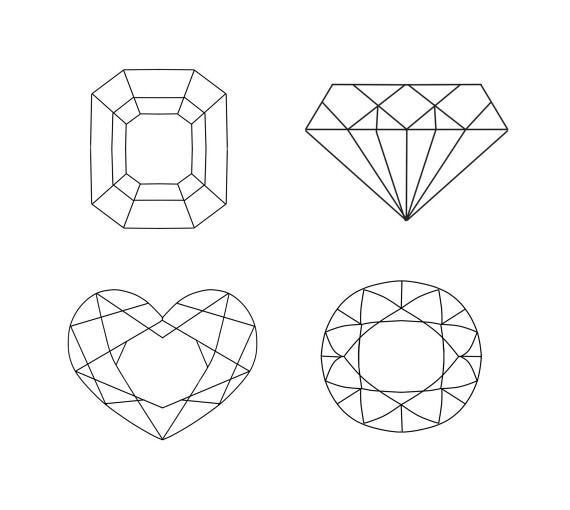 These gems will have very basic shapes, such as rectangle, circle, heart, and traditional diamond shape. Even if you don't have much experience working with Paint Tool SAI yet, this tutorial will help you to grasp the most common techniques. Let's begin by creating a New Canvas about 3200 x 3200 px. Because we're making four different gems, you can make each one separately on its own canvas, or place them all on one canvas. In the last case, use the New Layer Set option from the Layer Panel to group each gem's working layers separately. First of all, let's make a rough sketch of the gem with rectangular shape. Choose the Pen or Air Brush tool, and begin to draw lines for the basic shapes. At this stage, the sketch can be messy and rough, as it is just a simple draft. Start with a rectangle, and then find its center by drawing diagonals from each corner. Add one more rectangle that is a bit higher than the first one. Make lines to show the edges of the gem, and when the basic shape is finished, add more details to the form. Then choose the Air Brush with 100% Density, make its size a bit bigger, and redraw the basic line. Now let's create some line work based on the sketch. Start by reducing the Opacity of the sketch layer to 80%. Then create a new Line work layer from the Layer Panel and place it on top of the sketch. This option will open a set of vector tools in the Color and Tool Panel. Choose the Line tool with 10 Size, 100% Min Size, and 100 Density. To start a new line, you can double click on the spot where you've finished the previous one, and then do a new line anywhere else. You can also make the inner lines thinner using the Weight tool from the vector tools panel. Change the Size to 4 and apply it to some of the inner lines. Here is the sample palette that will be used for this gem. Each gem will have its own color, and this one will be in shades of green. You can save this palette to your computer, open it in Paint Tool SAI, and pick the color directly from it with the Color Picker. Create a New Layer beneath the Line work layer and apply soft mint color as the base color for the shape. At first, use the Zoom in tool to bring the whole picture closer to the view, and then choose the Pen tool to make the inner outline of the gem. After that, take the Bucket tool and fill in the borders with color. Now we can create separate layers for each color we have in the palette. Make a New Layer on top of the base color layer and beneath the Line work layer, and check the Clipping Group option from the Layer Panel to connect it with the base color layer. Paint with selected color from the palette in some areas, and then repeat the process with the next color, creating a new layer for each of them. After you've finished with the separate colors, choose the Air Brush tool with the maximum size and 90 Density and create gradient effects with the lighter and darker variations of the basic palette colors. At this stage, let's change the color of the Line work, so it will look more natural. Create a New Layer on top of the Line work layer and check the Clipping Group option from the Layer Panel. This way, only the lines from Line work layer will be recolored. Take the Air Brush with white color and apply it to the center of the gem. Choose dark green to recolor the outer border lines, and then use the Blur tool from the Color and Tool Panel to create a gradient from white in the center to green at the borders. Our next step is to add texture to the gem. Create a New Layer on top of all other layers and set its Mode to Overlay. Then take the Air Brush tool and change the default brush to the one called Middle Flat. Add some colors of your choice to the gem, and this brush will give it a good texture. For the center of the gem, let's use a three-color gradient, which goes from lighter color in the bottom left corner to darker color in the top right corner. Also add sparkles and volume to the gem by making the white lines of the Line work thicker in the center. To achieve this effect, create a New Layer and use the Air Brush with a small size to redraw the lines. Now we will add brightness to this gem. Create a New Layer on top of the others and set its Mode to Overlay. Choose the Air Brush and apply several different colors to the drawing. For this purpose you can use orange, purple, yellow, and much more. Then create one more layer with Luminosity Mode and add a few bright spots. Also add some small white dots using the Pen tool to add depth. And lastly, add borders for the gem. Create a new Line work Layer and use the same Line tool as before. Circle the inner borders with dark green and the outer border with mint color. And now the rectangular gem is ready! Good job! Now let's make a gem with the shape of the heart. Either create a New Canvas or make a New Layer Set from the Layer Panel and place it on top of the previous group of layers. First of all, create a rough sketch of this gem. Choose the Pen or Air Brush tool, and begin to draw lines for the basic shapes. Start with a simple rectangle, and then add a vertical central line. Place the heart shape for the gem in these borders. When the basic shape is finished, add more lines to the shape. These lines could be random, but try to keep them symmetrical. Now let's create the line work. Reduce the Opacity of the sketch layer to 80%. Then make a new Line work layer from the Layer Panel and place it on top of the sketch. Choose the Line tool with 10 Size, 100% Min Size, and 100 Density, and make this line work based on your previous sketch. Different shades of pink are collected in the sample palette for this gem. If you want to use this palette, then save it to your computer, open it in Paint Tool SAI, and pick the colors directly with the Color Picker tool. Create a New Layer beneath the Line work layer and apply hot pink as the base color of the shape. At first, Zoom in on the whole picture, and then choose the Pen tool to make an inner outline for the gem. After that, fill in the borders using the Bucket tool. Now create separate layers for each color we have in the palette. Make a New Layer on top of the base color layer and beneath the Line work layer, and check the Clipping Group option from the Layer Panel to connect it with the base color layer. Make as many layers as you need to fill the shape. After you've finished with the separate colors, choose the Air Brush tool with the maximum size and 90 Density and create gradient effects on these separate layers, using the lighter and darker variations of the basic palette colors. The next step is to change the color of the line work. Create a New Layer on top of the Line work layer and check the Clipping Group option from the Layer Panel. Take the Air Brush with white color and apply it to the center of the gem. Choose pink to recolor the border lines, and then use the Blur tool from the Color and Tool Panel to create a gradient from white in the center to pink at the borders. Let's add texture to the gem. Create a New Layer on top of all other layers and set its Mode to Overlay. Then take the Air Brush tool and change the default brush to the one called Middle Flat. Choose colors like yellow, orange, and soft blue. Now we will add brightness to the gem. Create a New Layer on top of the others and set its Mode to Overlay. Choose the Air Brush to apply bright colors to the gem. Then create a layer with Luminosity Mode and paint over the central line work lines to create a shiny effect. Add a few white sparkles with the Pen tool. The last step is to add borders to the gem. Create a new Line work Layer and use the Line tool to circle the inner borders with purple and the outer border with hot pink. Yay! The gem in the shape of a heart is now ready! Now it's time to create a new gem, which will be in the shape of a triangle, a classic diamond shape. Let's start with the New Canvas, or New Layer Set if you're working on the same canvas. Choose the Pen or Air Brush tool, and begin to draw lines for the basic shapes. Start with a simple rectangle, and then add a vertical central line. Also define the size of the gem, and then place it inside the outlines. Continue adding more helping lines, and then add details by connecting some of them. All the bottom lines should be connected in the center. This time we can avoid doing thicker outlines and go directly to the line work. Before doing the line work, reduce the Opacity of the sketch layer to 80%. After that, create a new Line work layer from the Layer Panel. It will open a set of vector tools in the Color and Tool Panel. Choose the Line tool with 10 Size, 100% Min Size, and 100 Density. Start to redraw the sketch lines, keeping both sides of the gem symmetrical. The palette for this gem is in shades of blue. Save this palette to your computer, open it in Paint Tool SAI, and pick the color directly from it with the Color Picker. Create a New Layer beneath the Line work layer and apply the bottom blue color from the palette as the base color for the shape. At first, Zoom in on the whole picture, and then choose the Pen tool to make an outline for the gem. After that, take the Bucket tool and fill in the borders with this color. It's time to create separate color layers for this gem. Make a New Layer on top of the base color layer and beneath the Line work layer and check the Clipping Group option from the Layer Panel to connect it with the base color layer. Paint with the selected color from the palette in some areas, and then repeat the process with the next color, creating a new layer for each of them. To change the color of the line work, create a New Layer on top of the Line work layer and check the Clipping Group option from the Layer Panel. Using the Air Brush, recolor the inner lines to white and the outer line to dark blue. Our next step will be to add texture to the gem. Create a New Layer on top of all other layers and set its Mode to Overlay. Then take the Air Brush tool and change the default brush to the one called Middle Flat. Add some colors of your choice to the gem; it could be orange and purple for this instance. Create a New Layer on top of the others and set its Mode to Overlay. Choose the Air Brush and apply a bright color to the gem, so it will be even more shiny. Then create one more layer with Luminosity Mode and increase the brightness in some spots. Also add some small white dots with the Pen tool to add depth. And lastly, add borders for the gem. Create a new Line work Layer and use the Line tool to redraw the outer lines. Circle the inner border with dark blue and the outer border with lighter blue. And we've made a new shiny gem! Great job! The last gem in the set will have the shape of the circle, and will be done in orange shades to keep high contrast with the other gems. Begin by creating a New Canvas, or New Layer Set. Choose the Pen or Air Brush tool, and begin to draw lines for the basic shape. Make two perpendicular lines that cross each other in the center. After that, draw small lines the same distance from the center on the main axes. They will work as borders for the shape of the gem. Add even more lines on the main axes, because they will be needed to build the shape's details. Also add two diagonal lines that cross each other in the center. Connect all the lines, creating a symmetrical shape. Reduce the Opacity of the sketch layer to 80%. After that, create a new Line work layer from the Layer Panel. It will open a set of vector tools in the Color and Tool Panel. Choose the Line tool with 10 Size, 100% Min Size, and 100 Density. Start to redraw sketch lines, keeping both sides of the gem symmetrical. Also make the inner lines thinner using the Weight tool from the vector tools panel. Change its Size to 4 and apply this to the inner lines. The sample palette for this gem is in shades of orange. If you like it, save this palette to your computer, open it in Paint Tool SAI, and pick the color directly from it with the Color Picker. Create a New Layer beneath the Line work layer and apply one of the soft orange colors as the base color to the shape. At first, Zoom in on the whole picture, and then choose the Pen tool to make an outline for the gem. After that, take the Bucket tool and fill in the borders with this color. Now we can create separate layers for each color we have in the palette. Make a New Layer on top of the base color layer and beneath the Line work layer and check the Clipping Group option from the Layer Panel to connect it with the base color layer. Paint with the selected color from the palette in some areas, and then repeat the process with the next color, creating a new layer for each of them. To change the color of the line work, create a New Layer on top of the Line work layer and check the Clipping Group option from the Layer Panel. Using the Air Brush, recolor the inner lines to white and the outer line to dark orange. Now we will add brightness to the gem. Create a New Layer on top of the others and set its Mode to Overlay. Choose the Air Brush and apply several different colors to the drawing. For this purpose you can use orange, purple, yellow, and others. Then create one more layer with Luminosity Mode and add a few bright spots. Also add some small white dots with the Pen tool to add depth. Our next step will be to add texture to the gem. Create a New Layer on top of all other layers and set its Mode to Overlay. Then take the Air Brush tool and change the default brush to the one called Middle Flat. Add some colors of your choice to show the texture. And lastly, add borders for the gem. Create a new Line work Layer and use the Line tool. Circle the inner borders with maroon color and the outer border with light yellow. And... this gem is ready! Awesome! The Set of Four Gems Is Now Finished! You've done amazing work! I hope you had fun making this set of gems, and it helped you to get to know vector tools in Paint Tool SAI better. Good luck in creating! My name is Anastasia Purtova. I'm an illustrator and designer, with passion for Digital and Vector Art. I like to work on game graphic, create interesting characters and animals. I am a big fan of simple design and creative thinking. Hope you'll find some discoveries and useful tips in my tutorials, and they will help you become even better artist!